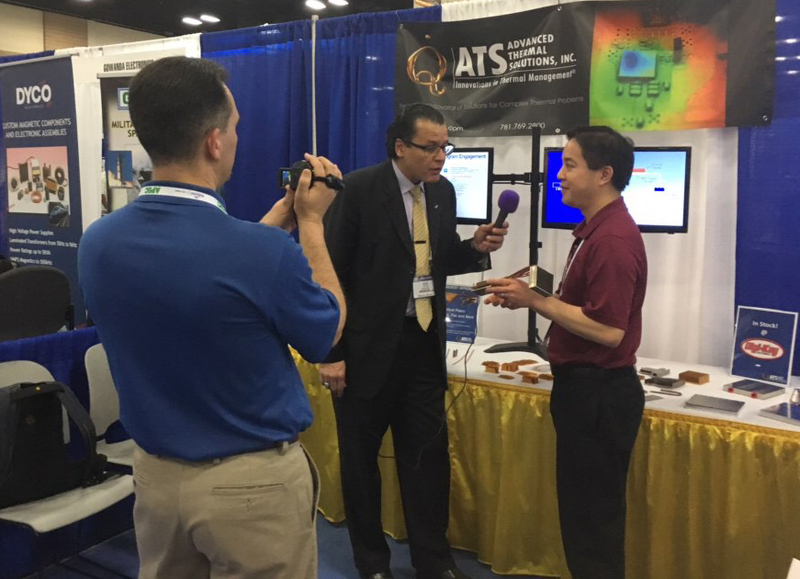 Advanced Thermal Solutions, Inc. (ATS) recently attended APEC 2018 in San Antonio to showcase the company’s thermal solutions for power electronics, meet with industry representatives, and learn the latest trends in the power industry. ATS has been a member of the PSMA (Power Sources Manufacturers Association), which is the sponsoring organization for APEC, for the past three years because ATS has a strong connection to the power industry and extensive expertise in keeping the industry cool. Vice-President of Sales and Business Development Steve Nolan and Product Engineering Manager Greg Wong manned the ATS booth during the show and took visits from sales representatives, distributors, and engineers from across the industry, some were familiar faces and some were learning about ATS expertise in thermal management of power electronics for the first time. The highlighted products were ATS liquid cold plates, which boast 30% better thermal performance than comparable products on the market and are easily customizable to meet a variety of applications, and the line of ATS high-performance round and flat heat pipes, which is expanding by the end of 2018 to give ATS the broadest offering of off-the-shelf heat pipes on the market. 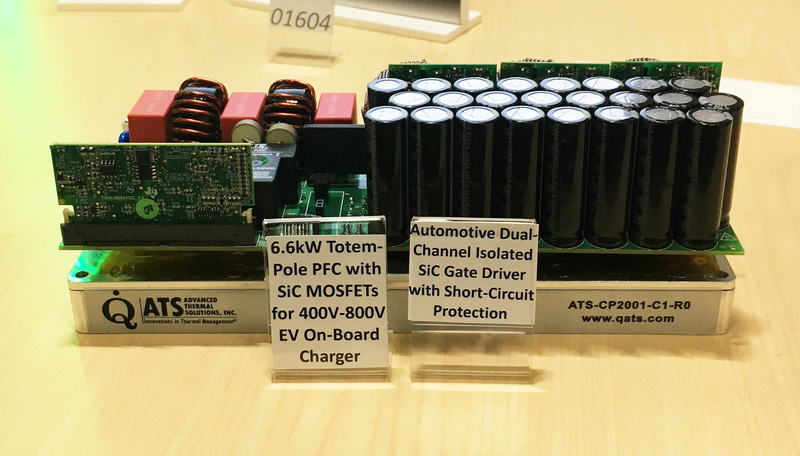 ATS cold plates were also featured in the Texas Instruments (TI) booth as part of a “98.5% efficiency, 6.6-kW Totem-Pole PFC Reference Design for HEV/EV Onboard Charger.” The base of the design was silicon carbide (SiC) MOSFETs with a C2000 microcontroller with SiC-isolated gate drivers, according to information presented by TI. Underneath the prototype that was on display at the TI booth was a custom ATS cold plate to meet the charger’s thermal requirements. ATS participation in the TI booth at APEC 2018 is a continuation of the strong working relationship between the two companies. ATS has also been a key reference design supplier of heat sink solutions for TI’s audio evaluation module. Wong and Nolan also learned a lot about the future of power electronics, including the prevalence of SiC and gallium nitride (GaN) components in the industry and the increasing popularity of liquid cooling, to keep ATS current on industry trends and ensure that the innovative thermal solutions that ATS provides can meet ever-rising power demands. While there is a lot that is new in the industry, IGBT designs continue to be popular and the standard IGBT footprint matches perfectly with ATS off-the-shelf cold plates to make an easy fit for engineers designing liquid cooling solutions. “If people are still making devices in that IGBT footprint then it will bolt directly to the cold plate, which is good news because that package is very popular, so it’s good to have those standard products,” Wong explained. Watch the video below as Greg Wong of ATS was interviewed by Alix Paultre of Power Electronics News at APEC 2018 about ATS heat pipes and cold plates. ATS has the expertise, products, and resources to provide off-the-shelf and customized thermal solutions for the power electronics industry. Learn more about the full line of products at https://www.qats.com or contact ATS at ats-hq@qats.com. Advanced Thermal Solutions, Inc. (ATS), a leading-edge thermal engineering and manufacturing company focused on the thermal management of electronics, is pleased to announce that it will be showcasing its new line of liquid cold plates and other thermal solutions for power electronics in Booth No. 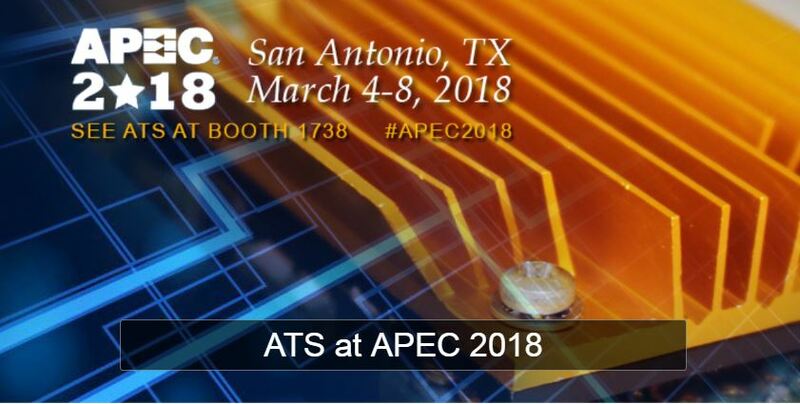 1738 at APEC 2018, the world’s premier event for applied power electronics, being held in the Henry B. Gonzalez Convention Center in San Antonio, Texas from March 4-8. ATS will have a video demonstration and samples of its newly-released liquid cold plates, which boast an innovative, internal fin array with an optimized aspect ratio that provides 30 percent better performance than other commercially-available cold plates currently on the market. ATS cold plates are the perfect thermal solution for power electronics, such as IGBT, wide-bandgap, and more. Cold plates are part of an array of liquid cooling solutions that ATS has to offer, including heat exchangers with the industry’s highest density fins to optimize heat transfer and a line of chillers for precise control of coolant temperature. In addition to its liquid cooling solutions for power electronics, ATS will also showcase its popular Power Brick heat sinks, which are based on the patented maxiFLOW™ design and specially designed for cooling 1/8, 1/4, 1/2, and full-brick DC/DC power converters. ATS has added a straight-fin option to its line of power brick heat sinks to give power engineers an option with a smaller footprint for crowded boards. ATS will also display samples of its vast array of high-performance flat and round heat pipes that are perfect for spreading heat away from high-powered components, particularly in boards that have high component-density and little space for other cooling methods. Visit ATS at Booth No. 1738 at APEC 2018 and join Steve Nolan and Product Engineering Manager Greg Wong to learn more about the numerous thermal solutions that ATS has designed for the power electronics industry. 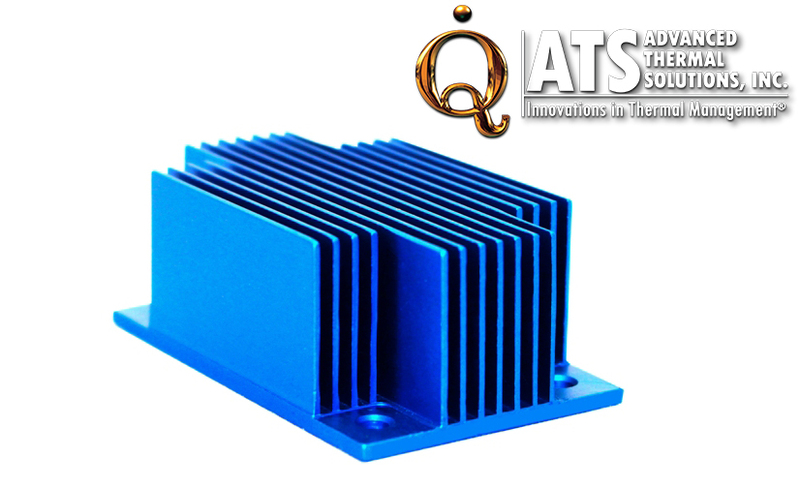 Find more information about ATS liquid cold plates, Power Brick heat sinks, or ATS consulting and design services, at https://www.qats.com/ or contact ats-hq@qats.com. We’re at #APEC2016 and hope to see you! See us @digikey booth 1663. We’ll have our design kit on display. Our design kit features our family of power brick heat sinks specifically designed for electronics cooling of power bricks. You can learn more about the line at this link to our Power Brick Heat Sink page. The focus of this presentation is to describe the challenges of thermal management in Industrial lighting applications, the implications of temperature stress on the system, a practical guide to identifying the problem and various methods to resolve the issue. The emergence of LED technology has changed the shape of the lighting industry. The implementation of LED applications allows the designers to take advantage of several key characteristics of the technology. This includes energy efficiency and the ability to control the direction, color, timing, etc. of the light source itself. These attributes can be particularly effective in industrial and commercial applications where harsh environments, building automation controls and cost of deployment may be different than consumer fixtures. Light emitting diodes are semiconductor devices and thus they have the benefits and limitations of such devices. The benefits include optimum energy efficiencies, volume manufacturing and hi package density. One key factor in deployment is how to efficiently dissipate the power produced. Lack of attention to thermal stress can lead to many undesirable results. Performance can be impacted as an LED spectrum can change as a factor of heat. Color change can cause issues in fixtures for color matching and design elements. Temperature stress is also the key contributing factor to failure mechanisms. Poor thermal management therefore can affect fixture life, time to replacement and visual quality, if portions of the LED matrix age prematurely. To identify the challenges and address the concerns it is helpful to begin with a full model of the application. This can start at the outside environment, to the enclosure, the PCB, the LED package and the die. Additionally it is helpful to consider how power is dissipated including conduction, convection and radiation. With the problem defined and the available paths known, an optimized solution can be developed. There are multiple variables to the equation, but by identifying the dominant factor a resistance network can then be developed which will lead to a solution that can be validated analytically, computationally and experimentally. The solid state lighting market continues to grow and allow for increasingly sophisticated applications. It is critically important that design and system engineers understand the challenge and are equipped to address these concerns. With careful analysis of the environment, calculation of the source, examination of the options and implementation of the solution, engineers can take advantage of LEDs to improve current applications while exploring new markets for the technology. Are you going to the Applied Power Electronics Conference in Long Beach, CA? If so we’ll see you there! ATS’s Peter Resca, our Sr. Director of Product Development, will be speaking and ATS is chairing the Thermal Management Track at APEC. Mr. Resca will be speaking on Thermal Management of LED lighting, a critical part of an LED light. You can see him and ATS at location 201A on Wednesday, March 23, 20167 from 8:30AM to 10:30AM. If you cannot make it to APEC to see Peter’s talk, we’ve got a resource designed around thermal management of LED lighting. It is our LED Cooling Design Kit. Click here for free access to our kit. And if you are going to APEC, drop us some email at ats-hq@qats.com so we can connect up and say hi!